This article is about the R.E.M. song. For the Grey's Anatomy episodes, see It's the End of the World and As We Know It. "It's the End of the World as We Know It" redirects here. For the Steve Aoki extended play, see It's the End of the World as We Know It (EP). Cover of the USA 7" release. 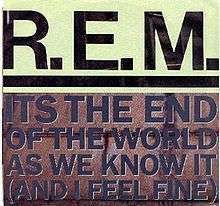 (1987) "It's the End of the World as We Know It (And I Feel Fine)"
"It's the End of the World as We Know It (And I Feel Fine)" is a song by the rock band R.E.M., which appeared on their 1987 album Document, the 1988 compilation Eponymous, and the 2006 compilation And I Feel Fine... The Best of the I.R.S Years 1982–1987. It was released as a single in November 1987, reaching No. 69 in the US Billboard Hot 100 and later reaching No. 39 on the UK Singles Chart on its re-release in December 1991. The song originated from a previously unreleased song called "PSA" ("Public Service Announcement"); the two are very similar in melody and tempo. "PSA" was itself later reworked and released as a single in 2003, under the title "Bad Day." In an interview with Guitar World magazine published in November 1996, R.E.M. guitarist Peter Buck agreed that "End of the World" was in the tradition of Bob Dylan's "Subterranean Homesick Blues.". The song was featured in the third episode of the 13th season of The Simpsons, "Homer the Moe". The music video was directed by James Herbert, who worked with the band on several other videos in the late 1980s. It depicts a young skateboarder, Noah Ray, rifling through an abandoned, collapsing farmhouse and displaying the relics that he finds to the camera. The video ends with a scene of Noah going shirtless and performing a bunch of moves on his skateboard. The track is known for its quick flying, seemingly stream of consciousness rant with a number of diverse references, including a quartet of individuals with the initials "L.B." (Leonard Bernstein, Leonid Brezhnev, Lenny Bruce and Lester Bangs). In a 1990s interview with Musician magazine, R.E.M. 's lead singer Michael Stipe claimed that the "L.B." references came from a dream he had in which he found himself at a party surrounded by famous people who all shared these initials. The song was included on the 2001 Clear Channel memorandum of songs thought to be "lyrically questionable" after the September 11 terrorist attacks. The song was played repeatedly for a 24-hour period (with brief promos interspersed) to introduce the new format for WENZ 107.9 FM "The End", a radio station in Cleveland, Ohio in 1992. When the station underwent a new format change in 1996, they again played the song in 24-hour loop. There was a documentary film made about the station entitled The End of the World As We Knew It, released in 2009 which featured many of the former staffers and jocks. Before the supposed Mayan apocalypse on December 21, 2012, sales for the song jumped from 3,000 to 19,000 copies for the week. A radio station in Calgary, Alberta (CFEX x92.9 FM) on December 21, 2012 played the song 156 times in a row back to back to coincide with the Mayan apocalypse event. The song can now be heard playing at one of the Quick-Service restaurants in Disney's Animal Kingdom at the Walt Disney World Resort near Orlando, Florida. It plays at Restaurantosaurus in the park's dinosaur-themed area. 1 – The single originally reached No. 87 in the UK. It reached No. 39 in 1991 upon re-release. 2 – Only charted in 1991 after the song's re-release. The cast of SMTV Live sang a variation of the song in the final episode on December 27th, 2003. Vic Chesnutt, who was "discovered" by R.E.M. 's Michael Stipe, recorded a very loose cover of the song for the 1992 R.E.M. tribute album Surprise Your Pig. Newfoundland folk-rockers Great Big Sea covered the song on their 1997 album Play under the title "End of the World". Their version is a minute and a half shorter than R.E.M. 's, yet still contains all the verses (the faster time is achieved primarily by their increasing the tempo). It peaked at #24 on the Canadian Singles Chart on the week of April 6, 1998. DC Talk covered the song on their 1997 live album, Welcome to the Freak Show. The Suicide Machines covered the song for their 2001 release Steal This Record. American actress America Ferrera covered the song during episode "Blackout!" of ABC television series Ugly Betty. On May 21, 2011, in preparation for the apparent 2011 end times prediction, the song was covered by Matt Nathanson, Sugarland, and Little Big Town in Holmdel, New Jersey, and Bon Jovi did a separate cover in Milwaukee, Wisconsin. Orange County ska punk band Starpool released a cover of the song as a digital download on December 21, 2012. In 2011, Chris Carrabba of Dashboard Confessional covered this song on his album Covered In The Flood. Peter Buffett covered the song and released it on December 21, 2012. ↑ "R.E.M.HQ: Albums". Remhq.com. Retrieved 7 November 2014. ↑ "YuppiePunk » Podcast #8: List Songs". Yuppiepunk.org. Archived from the original on February 1, 2014. Retrieved 1 February 2014. ↑ Thompson, Jim. "Video takes local kid's life for a turn". Online Athens: REM in the hall. Athens Banner-Herald. Archived from the original on 16 January 2010. Retrieved 16 January 2010. ↑ Ventre, Michael (2005-10-29). "Turn up the volume and cast your vote: Songs to inspire you for Election Day 2004". MSNBC. Archived from the original on 2004-11-04. Retrieved 2006-09-01. ↑ Olszewski, Mike (2003-01-01). Radio Daze: Stories from the Front in Cleveland's FM Air Wars. Kent State University Press. ISBN 9780873387736. ↑ "Doomsday facts". tribunedigital-chicagotribune. Retrieved 2016-03-12. ↑ "Non-Apocalypse Spurs Sales (Up 612%), Airplay Gains For R.E.M. 's 'End Of The World'". Billboard. Retrieved 7 November 2014. ↑ "x929 plays R.E.M. 156 times". SongFacts. Retrieved 6 May 2015. ↑ "Radio Station Marks End Of The World By Playing R.E.M. song All Day". The Huffington Post. Retrieved 2016-03-12. ↑ "Item Display - RPM - Library and Archives Canada". Collectionscanada.gc.ca. Retrieved 7 November 2014. ↑ Ableson, Jon. "Chris Carrabba To Release "Covered In The Flood" Solo Album". Alter The Press!. Retrieved 17 June 2013. ↑ "BuffettNews.com • View topic - Buffett Covers R.E.M.". Buffettnews.com. Retrieved 7 November 2014.